Democratic leadership, also known as participative leadership or shared leadership, is a type of leadership style in which members of the group take a more participative role in the decision-making process. This type of leadership can apply to any organization, from private businesses to schools to government. Everyone is given the opportunity to participate, ideas are exchanged freely, and discussion is encouraged. While the democratic process tends to focus on group equality and the free flow of ideas, the leader of the group is still there to offer guidance and control. The democratic leader is charged with deciding who is in the group and who gets to contribute to the decisions that are made. 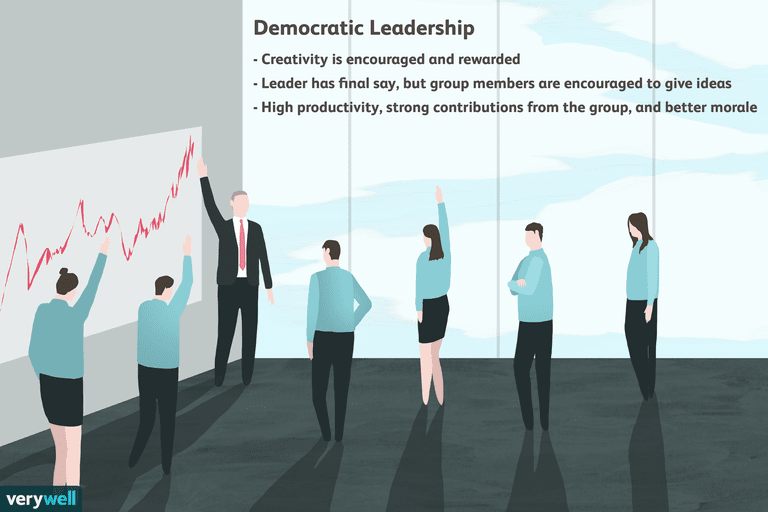 Researchers have found that the democratic leadership style is one of the most effective types and leads to higher productivity, better contributions from group members, and increased group morale. Group members are encouraged to share ideas and opinions, even though the leader retains the final say over decisions. Members of the group feel more engaged in the process. Creativity is encouraged and rewarded. Strong democratic leaders inspire trust and respect among followers. They are sincere and base their decisions on their morals and values. Followers tend to feel inspired to take action and contribute to the group. Good leaders also tend to seek diverse opinions and do not try to silence dissenting voices or those that offer a less popular point of view. Because group members are encouraged to share their thoughts, democratic leadership can lead to better ideas and more creative solutions to problems. Group members also feel more involved and committed to projects, making them more likely to care about the end results. Research on leadership styles has also shown that democratic leadership leads to higher productivity among group members. While democratic leadership has been described as the most effective leadership style, it does have some potential downsides. In situations where roles are unclear or time is of the essence, democratic leadership can lead to communication failures and uncompleted projects. In some cases, group members may not have the necessary knowledge or expertise to make quality contributions to the decision-making process. Democratic leadership can also lead to team members feeling like their opinions and ideas aren't taken into account, which may lower employee satisfaction and morale. Democratic leadership works best in situations where group members are skilled and eager to share their knowledge. It is also important to have plenty of time to allow people to contribute, develop a plan, and then vote on the best course of action. Gill, E. St. Thomas University Online. What is Democratic/Participative Leadership? : How Collaboration Can Boost Morale. January 15, 2016. Martindale, N. Leadership styles: How to handle the different personas. Strategic Communication Management. 2001:15(8):32–35.